Where did the Wise Men come from? And go back to? There is some consensus among Bible scholars that these three visitors came specifically from Persia in the East, rather than India or China. We don’t know for sure that they were astrologers, that is a possible implication from the fact that they had seen a celestial phenomenon of some kind, recorded as a “star”. Whether astrologers or not, we can surmise that they were learned or ‘wise’ men. Leading up to the first century A.D. and for centuries after, Persia was one of the most educated empires in world history. Already by 4 B.C., a possible year for the birth of Jesus, there were growing intellectual developments in the Persian Empire that would culminate in part with the founding of Gundeshapur University. One of the most remarkable centers of learning in the world at that time, Gundeshapur (also known as Jondishapur) was located in eastern Persia. Founded in 271 A.D. by the Sassanid Persian Empire ruler Shapur I, it was a complex blend of a Zoroastrian national university (the state religion of the Empire) and an educational center of the Persian Church of the East. Many of the teachers were Christians, so Biblical and theological studies were taught as well as Greek philosophy. When Roman Emperor Justinian closed the School of Athens finally in the sixth century, some of the Greek philosophers there were attracted to Gundeshapur. There were also Indian components in the studies of astronomy, astrology, mathematics and medicine. Gundeshapur became a key meeting place of Eastern and Western traditions of learning, while being at the interface of an encounter of the faiths of Zorastraianism, Christianity, Buddhism, Manichaeism, Hinduism, and from the seventh century, Islam. It is also fascinating to wonder what became of these three after their life changing experience in Bethlehem. If you believe like I do that they most likely came from Persia, and returned there, it becomes then even more important what happened in Persia in the coming centuries. Did they have a role in spreading the news of this baby who was heralded by Angels and announced by a star? We must remember that in the next five centuries of the Church’s growth, it was Persia and to the East that would see the greatest expansion numerically and geographically. Not the West as commonly thought. The Persian Empire would also see the most martyrs from the Christian faith in the next four centuries, not the Roman Empire. In fact there were far more. Many Zoroastrians would come to follow Jesus also in the next few centuries, and though Christianity never came to power as the state religion as happened in 312 in the Roman Empire through Constantine, there was significant growth of the Church. Christianity was indeed an Eastern faith, and up to the seventh century when Islam swept into Persia, could have been called a Persian faith. But there is something else very interesting to this story. And that is the role of the city of Edessa, a center of the Church later in the first century that became the launching pad for the growth to the East. Edessa, now the modern city of Urfa in southeastern Turkey near the Syrian border, was already connected by road to Jerusalem by the time of Jesus’ birth. It was a place that travelers from the East were already going through both ways on their journeys to and from the farther reaches of Asia. Did the wise men travel through Edessa? Perhaps more importantly to our story, did they go back through Edessa on their way home to Persia? Why is that even important? 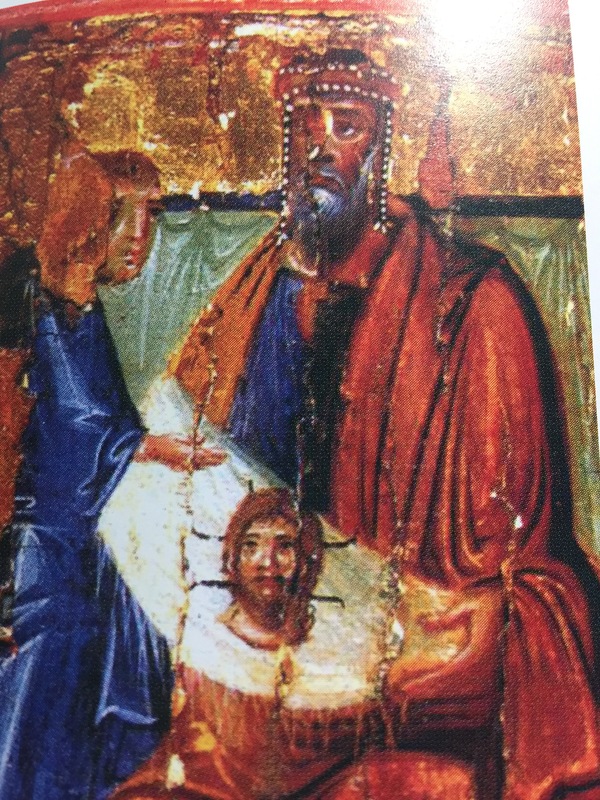 The painting (a wooden icon) that accompanies this post is of the King of Edessa, Abgar V, who was one of a line of Abgars who ruled there. (painting from Christoph Baumer’s excellent book, The Church of the East: An Illustrated History of Assyrian Christianity, pg. 17) It would be the Kingdom of Edessa that would become the first area in the later first century to proclaim an allegiance to Christianity. A tradition of the Church that Eusebius would write about in his fourth century history concerned one of these King Abgars, perhaps V. The tradition goes that the King was mortally ill, and he had heard of Jesus then alive and doing works of healing. He writes a letter to Jesus asking him to come to Edessa and pray for his healing, and even live there. Tradition says that Jesus wrote back, and declined to come but commended him for his faith. The King was healed anyway, and the message of Jesus would find many open doors in the Kingdom of Edessa. Whether this tradition is true or not, we do know that Edessa became the key place for the expansion of the Church to the East already by the first century A.D. How had they heard of Jesus and His Gospel? Is it possible that the first time they heard of him was when the three wise men came there on their way home? Did these three tell all who would hear of this amazing birth and Child? We do not know for sure. But we must always remember how important the East is to this story, and indeed to the story of Christianity as a whole. Steve, enjoyed the read. Well thought out. I will have to do so more reading on the University in Persia. One possible adjustment. We give the numerical figure to the Wise men of three because of the connection to the “three” gifts given and recorded in scripture; Gold, Frankincense & Myrrh. I submit to you that most likely there were more than three of these Men of wisdom and study. To make the fascinating journey, to navigate the terrain and stars, etc. Three gifts yes, but not knowing the total number of Wise men. Just a thought. Merry Christmas. Love ya. Mark Leuning. Thanks Mark-yes, you are correct there may have been more than three. Appreciate your thoughts. Previous Post 7th Century Eye Covers in T’ang China: What do you see? Next Post ‘Fences’: What do you do with pain entering 2017?